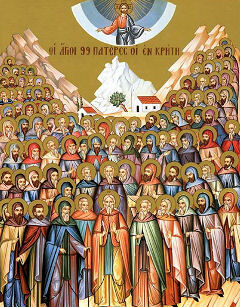 The Sermon on the Mount, as it is traditionally called, is found in Matthew’s Gospel, chapters five through seven. The first part of chapter five, the beginning of this largest block of Jesus’ teaching in the New Testament, is the famous Beatitudes. In the second half of that chapter, Jesus brings forward several examples from Jewish law, introducing each with some version of the statement, “You have heard that it was said….”, followed by the statement of the commandment. Then, in each case, Jesus changes the commandment. What is interesting to me about these reinterpretations of Jewish commandments is that Jesus is drawing our attention away from a particular behavior that is forbidden and refocusing us not on the behavior itself, but on the internal process that leads to the behavior. So our attention is redirected from the forbidden act of murder toward the build up of anger that culminated in the murder, and our attention is directed away from the act of adultery and toward the internal process that led to the adultery. In doing this, Jesus is pointing out something that should be rather obvious: that our actions don’t come from nowhere – our behavior in the world is connected to what is going on inside us, in our hearts, minds, and souls. Jesus invites us to put our attention there, on our interior life, and on the emotional, spiritual, and psychological processes that are unfolding within us. In another place, Jesus tells his disciples that a person is not defiled by what kind of food in consumed, but rather is defiled (or not defiled) by what comes out of him or her. That is, the speech and actions that come forth from within us. One of the fundamental criticisms Jesus makes of the religion of his time (and it is a criticism that could just as well be made about the Christianity of our time) is that too many people spend too much time focusing on the outward observance of ritual. He is not necessarily critical of the ritual, but he is critical of the disconnection that he perceives in so many people between the outward ritual and the inner meaning that is connected to it. In other words, ritual is energized and meaningful because of the faith, the internal disposition, of the people doing the ritual. In the absence of that faith, in the absence of genuine relationship with God, the ritual becomes meaningless. In this section of the Sermon on the Mount, he is making a similar criticism: law focuses on external behavior, and seeks to regulate it. But genuine transformation cannot be imposed by outside regulation; it can only truly come from within, from the processes in us that give rise to the behavior which the law seeks to regulate. And this is very much the essence of the spiritual life. The contemplative practices of prayer (which the Christian tradition has rather consistently held to be the most important or valuable practices) all involve looking inward. That inward look is meant to afford us, in part, an opportunity to recognize what is going on in our interior life so that God might have an opportunity to transform it. We are not meant to stay there – our life in the world is important. But as we begin to allow our interior lives to be transformed, the quality of our outer life will change. Our behavior in the world will also be transformed. And because that change comes from an interior reformation, it will last. And, part of the reason it will last is because it is not a change made under threat of penalty. Rather, it is a change that has come about through the grace of a loving God who desires not to beat us into submission but to love us into new life. Have you forgotten the day we buried our father together? Have you forgotten the day we carried his dead body into the cave near Hebron? Have you forgotten the day we entered the darkness of Machpaelah to lay our Patriarch to rest? Have you forgotten the day we made peace? The day we set aside past injustices and deep wounds to lay down our weapons and live? Or the day we, too, buried our father together? Have you forgotten that we took Isaac’s corpse into that humble cave to place him with his father Avraham for eternity? Brother, I don’t remember crying with you. Sister, I don’t remember mourning with you. We should have cried the tears of generations. Divided only by time and history. My brother calls you Allah. My sister calls you Adonai. You speak to some through Moses. You speak to some through Mohammed. We are one family, cousins and kin. Lay down our weapons and live. And joy to our hearts. The two do indeed belong together. 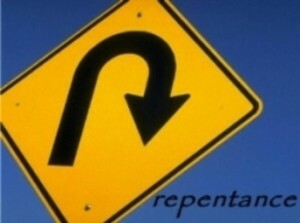 For the true meaning of the word “repentance” is “to turn around”, with the implication that having turned around, one is to head in a different direction. Far from the popular dreary notion of beating one’s self up for one’s sins and feeling very sorry for it, repentance is the positive process of recognizing where we need to make changes, and dedicating ourselves to starting over, to beginning a new and more healthy chapter. One cannot really do that, however, if one is unaware of the places in life where changes do need to be made. And that awareness is the fruit of self-examination. To examine one’s self is to be willing to face the truth of one’s life honestly. It does not mean to be undeservedly hard on one’s self. But it does mean looking at one’s life with both love and honesty. Self-examination and repentance are not only good practices for individuals. They are also good practices for organizations and communities. Just as people have places in their lives where changes need to be made and new beginnings launched, so do groups. I have been thinking a bit about this in the wake of our recent national elections. Regardless of how you voted, the results of all of our voting brought one party success and the other much less success. In the aftermath of these results, a great many leaders of the Republican Party have been trying to explain their disappointment. They have sought to place blame in various different places. What has been fascinating to me as I have watched this blame game unfold is the reluctance that most of the Republican leadership seems to have to actually engage in the time-honored practices of self-examination and repentance. When things don’t work out the way we expected them to, sometimes it is indeed because of forces beyond our control. But sometimes (and more often than we probably like to admit), the results have to do with us: things we said or didn’t say, things we did or didn’t do. It is a very natural thing to want to find a scape-goat for our problems, someone or something that we can use to assure us that we have no need to change – rather, our problem is entirely due to someone or something else. But if we devote all our energies to finding a scape-goat (or many scape-goats), then we won’t have much left to devote to looking at ourselves. And that usually means we miss something crucially important. This is not really a blog post about Republicans, nor is it really about Democrats, either. The reaction of most Republican leaders in the wake of the election simply provides a good real-life example of a problem that afflicts us all to some degree, that afflicts most organizations, and that seems to afflict politicians to a considerable degree. And that is our reluctance to really look at ourselves, to see ourselves both in love and honesty, and recognize where we need to change. It takes a certain courage, a certain strength of heart, to do the work of self-examination and to follow that up with genuine repentance – true change. But if we are willing to find that courage, the fruit of these practices both for us as individuals and for the organizations to which we belong can be abundant, indeed. Most of you probably know that whole story about Adam and Eve from the Book of Genesis. How they were living in this idyllic paradise, in peace and harmony with creation and with each other, and completely fine to be hanging out naked. And then they end up eating the fruit of the Tree of the Knowledge of Good and Evil, realize they are naked, get embarrassed, make clothes, and end up losing both the idyllic paradise and the perfect harmony that came with it. This tragic story came to be called “The Fall”. There are many and various ways to interpret this story. And, first of all, let me say that I don’t interpret it literally, and neither should you. It is first and foremost a story meant to tell us something deeply true and meaningful about our own humanity, and our relationship with God, creation, ourselves and one another. One interpretation, which I came across in the writing of Richard Rohr, strikes me as particularly powerful. For Rohr, the story of “The Fall” is the story of falling into dualism, and its consequences are not at all good. 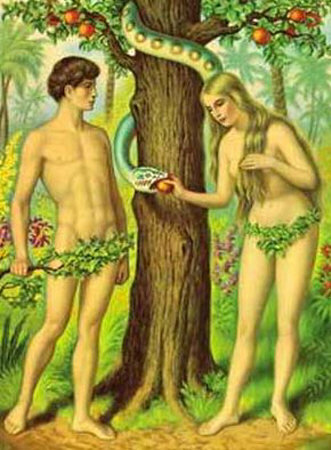 Prior to getting enmeshed with the Tree of the Knowledge of Good and Evil, Adam and Eve are happy and content. They are able to be open to everything around them and within them. Their vision is an expansive one, and it is whole. Everything has its place, and, as Genesis has it, it is all very good. They are able to encounter the world non-dualistically. After they eat of the tree, however, their perspective is changed. Suddenly, they begin putting things in categories. Their holistic vision is fractured into pieces, and now there are things that are good and things that are bad. Adam and Eve are no longer able to encounter the world with openness; they close themselves down. They hide from the Holy one, and the clothes they receive represent a buffer that has been introduced between themselves and the world around them. And the result of this descent into dualism is that the world no longer appears to them as a paradise, and the harmony with which they were able to live with all of creation is lost. This interpretation of the fall of human nature from non-dualism into dualism means, of course, that one of the ways in which the Christian tradition (and other traditions) seek to heal us is by helping us to return to non-dualism. Many of the parables of Jesus, which at first glance seem not to be entirely sensible, open up with new meaning when we see that they are aimed at moving us back into a non-dualistic perspective. To love both one’s neighbors and one’s enemies, for example, is a non-dualistic approach to life. This teaching seeks to lead us back to a place where we stop sorting people into the the “neighbor” and “enemy” categories, and learn instead to embrace all people as one human family. Love is the mechanism, the tool, the spiritual practice that can help us leave these categories behind. Political campaigns both depend on dualism and exploit it. They require us to see one candidate as our friend or neighbor, and to see the other candidate as our enemy. Horrible things are said in the service of this dualism, lies are told, threats are made, dire consequences are predicted. At the root of it all is the conviction that one candidate must be right and the other must be wrong. One party must be right and the other must be wrong. That is the ultimate dualism. It is a questionable strategy for political campaigning, but it is a disastrous one when it comes to the actual business of governing. As long as one group of politicians sees themselves as right and sees the other as wrong; as long as one group looks upon the other as the enemy, it is very difficult to get anything accomplished. As we have seen these past couple of years. Now that we have finally emerged from the heat of the election, it is time for our politicians to learn to see non-dualistically, to start looking at the whole, to recognize that all of us have a place, and that only by working together in the service of that whole can we actually move forward in our national life. Of course, those of us who vote for politicians need to do the same. We need to stop looking upon some of our fellow citizens, and some of our leaders, as the enemy. We need to do exactly what Jesus said we should do: love not only our neighbors, but our enemies, and through the spiritual practice of love arrive at a place where we can actually work together for the common good.